Speedup Multipurpose Business Portfolio Responsive WordPress Theme is perfect if you like a clean and modern design. The clean design helps create a first impression of a thoroughly professional and mature corporate entity, about and team section in the theme. 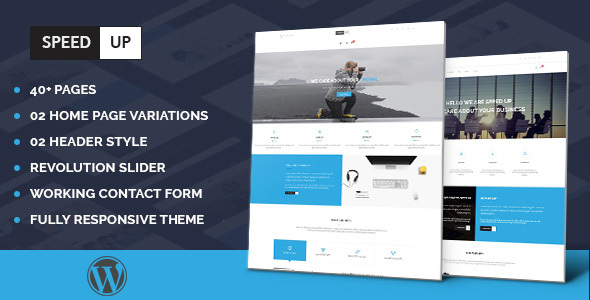 This WordPress Theme is simple and elegant style that allow you to stand out from other companies Customize your website as much as you want, you have tons of layout possibilities with unlimited variations and colors. We built this theme on Visual Composer, a very convenient drag-n-drop Page Builder for WordPress. It should provide you with the smoothest experience while creating your website with our theme. The WordPress theme is 100% responsive.